There might be times when we want to get a duplicate bill. This article is written to help you out know how to get CESC copy bill or CESC duplicate bill. You can view CESC copy bill in the official website of CESC. You can also print the CESC duplicate bill if you want. We have written step by step instructions with appropriate links about the procedure to get CESC copy bill online. The printed copy bill is accepted in all the cash offices. How to get CESC copy bill or CESC duplicate bill online? 1. Visit the official website of CESC to get a CESC copy bill or CESC duplicate bill online - https://www.cesc.co.in/newcopybill/copybill_new_input.jsp. 2. Enter your 11 digit customer id in the text field. Customer id is not same as consumer id. Even though both are 11 digits, they are different. If you do not know your customer id, click on the link 'click to know your customer id' to get your customer id from your consumer id. 3. Enter the verification string shown in the image. 4. Click on 'Generate Duplicate Bill' button. You will get the CESC duplicate bill displayed in PDF form. You can view or print the CESC copy bill. 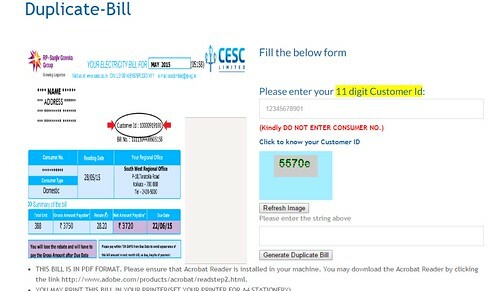 You need to have acrobat reader installed in your machine to view or print the bill as the CESC copy bill is in PDF format. If you do not have PDF installed in your machine, you can download it from the official website of Adobe - http://www.adobe.com/products/acrobat/readstep2.html. To print the CESC duplicate bill in your printer, set the printer for A4 stationery. If you would like to pay your CESC bill, you can read the below article to know the step by step instructions of CESC online bill payment. Article Link - CESC online bill payment. If you would like to register your email id, date of birth or mobile number with CESC, you can read the below article to know the step by step instructions of CESC registration. Article Link - CESC registration. CESC is actually a public limited company of the RP-Sanjeev Goenkra group. It serves over 3 million consumers of different types like domestic, industrial and commercial categories. CESC also has its own Transmission and Distribution system through which it serves its consumers. Budge Budge Thermal Power station located in Budge Budge, West Bengal. Haldia Energy Power Station located in Haldia, West Bengal. Southern Thermal Power Station located in Kolkata, West Bengal. Titagarh Thermal Power Station, located in Titagarh, West Bengal. Hope the article on How to get CESC Copy bill or CESC duplicate bill online' helpful for you. Please let us know if you find any difficulties in viewing or printing them online.